When it comes to eCommerce, we have seen plenty of trends come and go. Once something new and amazing comes along, it works well with customers – until everyone starts doing it. Once the market is oversaturated, it’s time to turn to the next big tactic. 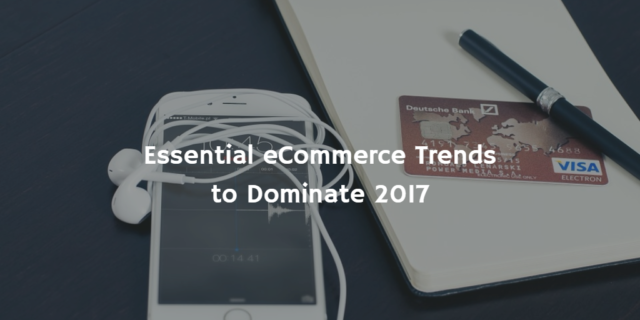 Here are the essential trends that you won’t want to miss for your eCommerce business in 2017. Chatbots are about to become big news in the world of marketing. Facebook Messenger already has a fair few of them rolled out, and they look set to make more of an impact as the year goes on. Marketers noticed that people are spending more time on Facebook Messenger than on other apps. So how to get their attention? By talking to them right there in the app. The chatbots will help guide customers towards purchases that suit them, as well as running interactive competitions and marketing campaigns. We need to wait a bit longer to gauge their success, but everyone will be trying this out in 2017. The US has always been the main driving force in the e-commerce industry. That is, until now. Asian markets are now starting to dominate more, and it’s highly likely that you will need to attract Asian customers if you want to continue riding this wave of success. So how can you do this? Make sure that your goods can be shipped to Asian countries, or that you have translations working for your customers who don’t read English if you run a service-based e-commerce site. Pick up on trends in Asia if you want to sell more. More and more, we are seeing customers sign up for the subscription service. Normally this takes the form of a “box” delivered to the door, which can contain random items each month – or week. You can also now subscribe via Amazon to have the same product delivered to your door on a regular basis, normally for beauty or household items. Subscriptions could be the way of the future for all kinds of goods. If you sell one-off pieces, consider introducing digital loyalty cards instead. More purchases mean more rewards and customers feel compelled to come back to you instead of to your rivals. More than ever, the focus is on mobile conversions. The new trend for 2017 is to stop thinking of desktop users and mobile users as two different groups. Actually, they are the same people. Make your experience seamless so that people can jump from their smartphone to their desktop without any interruption. Ensure that you can take easy payments from mobile, and consider creating a mobile app to make payments easier. If you can do next-day delivery, you probably think you’re working fast. But in 2017, the next day may be too late. With the introduction of drones into the delivery forces of the world, it’s now all about being as quick as possible. Same-day delivery should be a goal for the year. If you are delivering locally it should be a no-brainer. If your customers are international, you may have more of a struggle figuring out how to get things to them quicker than ever before. What you need to be aware of is that you are up against the big guns – and Amazon have their sights firmly set on worldwide same-day delivery programs. Selling in 2017 online means selling smart. Try these key trends before the rest of the industry and you’ll be onto a winner. Look out for the next big thing too! Mary Frenson is a Marketing Assistant at Checkdirector.co.uk, a new source of information on UK companies. Mary is always happy to share her marketing ideas and thoughts on business issues. In her free time, she enjoys handicrafts.